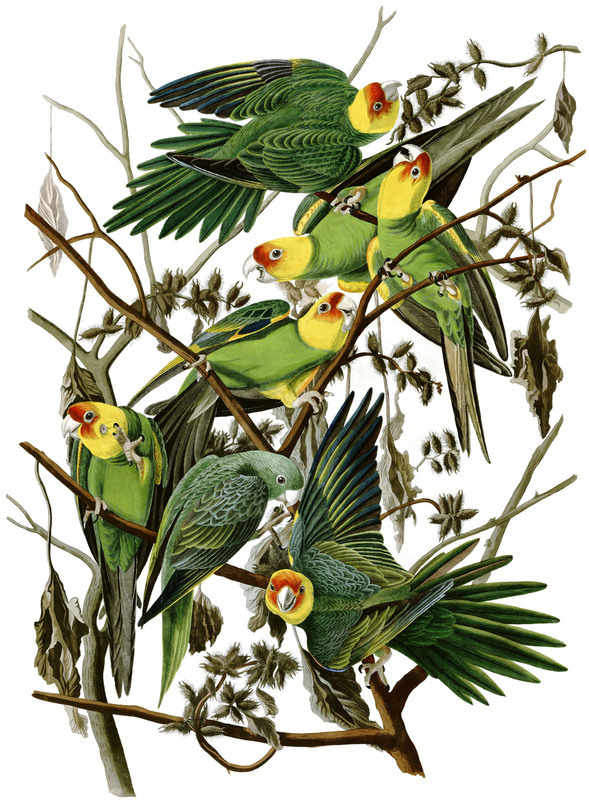 A painting of the now-extinct Carolina Parakeet by early naturalist Alexander Wilson. What do birders miss when they look back on some of the avian potential lost before Americans became more protective of their wildlife? Obviously, we lament the loss of birds like the ivory-billed woodpecker or the great auk. Losses of bird life in the Hawaiian islands have been staggering. We also lost tiny birds — dusky seaside sparrow and Bachman’s warbler — that would have gone unnoticed by most people. I’m confident we mourn the loss of some of the most abundant birds to ever roam the continent. 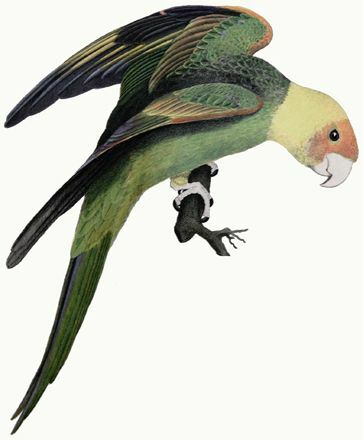 One such bird was the now-extinct Carolina parakeet. Many people don’t realize that North America was once home to its own species of parakeet. A few individuals — all that remained of once massive flocks of colorful, noisy native parakeets — made it into the 20th century. The last specimen died in the Cincinnati Zoo on Feb. 21, 1918. Although not declared officially extinct until 1939, the population of the Carolina parakeets crashed suddenly and for reasons still not fully understood. Early American naturalist and artist John James Audubon painted this flock of Carolina Parakeets. For instance, large flocks of these birds still flew free until the final years of the 1800s, but in the first decade of the 1900s, these flocks disappeared. The survivor at the zoo was named Incas, and this male Carolina parakeet died a year after his mate, who had been named Lady Jane by the zoo’s staff. The only other native parrot — the thick-billed parrot of the American southwest — no longer flies north of the Mexican border. An attempt to re-introduce this parrot to Arizona in the 1980s ended in disappointing failure. 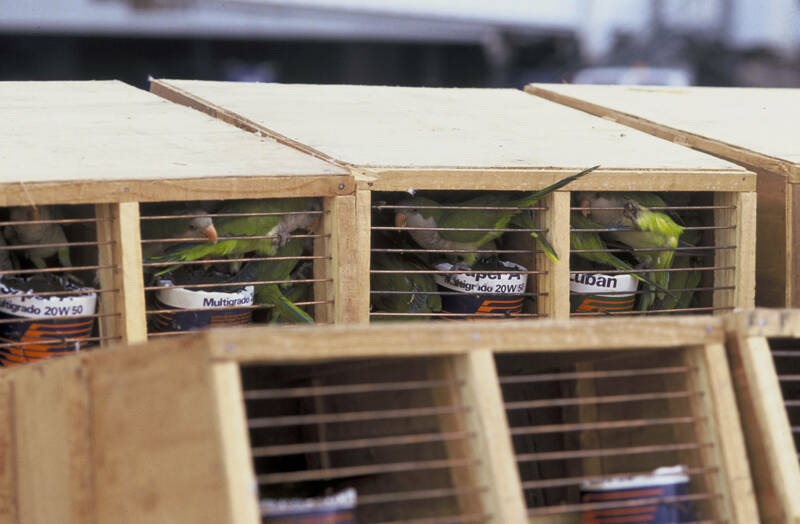 To look for parrots in the United States, one usually needs to travel to Florida. The Sunshine State has become a place to find exotic wildlife, from pythons to caymans, as well as a multitude of unusual birds that have escaped from captivity and now find the warm climate of Florida suitable for a feral existence. Photo by Bryan Stevens This pair of Monk Parakeets has been making a home at an electrical substation in Newland, N.C. When it comes to parrots, however, there is one species, perhaps tougher than its kin, that has expanded its range across the country. Called the monk parakeet (or quaker parakeet in the pet trade) this bird is not a native species, but it has proved tenacious in making itself at home in such far-flung locations as Delaware and Michigan, as well as Connecticut and Rhode Island. These green beauties have even made themselves at home in New York City. The monk parakeet has also established colonies in Canada’s British Columbia. Closer to home, these parakeets have also established colonies in Virginia and North Carolina, although I cannot confirm any such attempts in Tennessee. 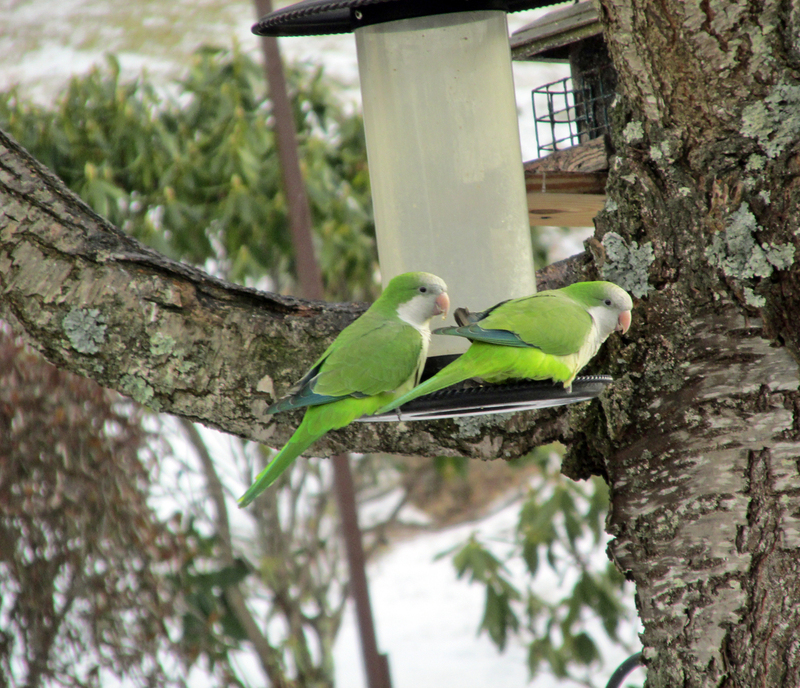 I recently got to see my first monk parakeets in the wild after learning on the Facebook page Carolina Birders that a pair of these parakeets has been found in Newland, North Carolina. Being only about a 20-minute drive from Roan Mountain, Tennessee, it was not difficult for me to make two trips to Newland to look for these two birds, which are residing at an electrical sub-station. I failed to find them on my first trip on a rainy, windy day. When the weather improved, I tried again on Feb. 19 and was successful. 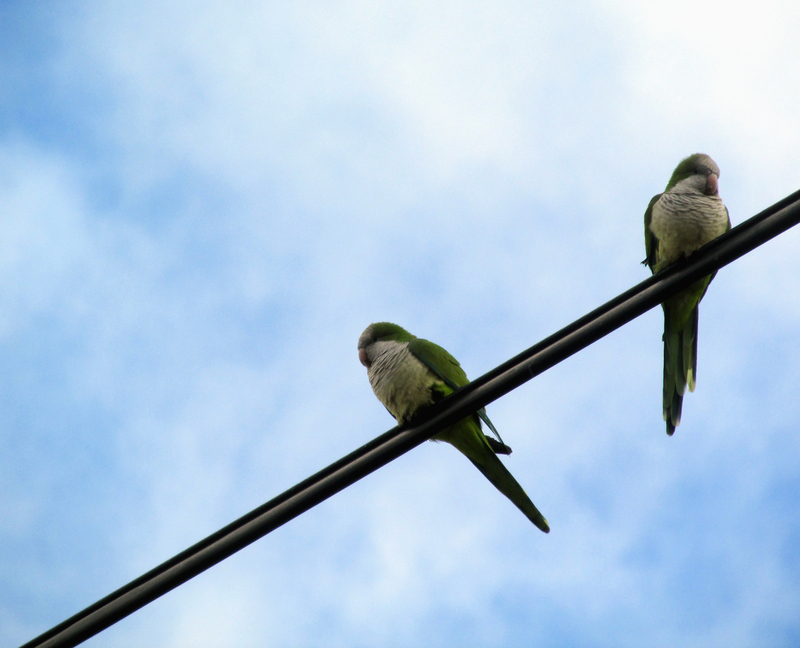 I saw the parakeets seated on their nest, perched on wires and visiting a feeder at a home near the sub-station. Photo by Bryan Stevens This pair of monk parakeets have built a nest in an electrical substation in Newland, North Carolina. The feral population of these parakeets in North America stems from wild birds brought from Argentina for sale as pet birds in the 1960s. The origin of feral monk parakeets in the United States dates back to the 1960s when birds brought from their native Argentina for sale in the pet trade escaped and subsequently thrived in various locations in the country. In researching this bird, I discovered that in North Carolina there are known colonies in Wilmington and Charlotte. Perhaps the pair in Newland are individuals expanding from those colonies. Monk parakeets are most abundant in Florida, but these birds have been found in numerous states, from Texas and Ohio to New Jersey and Delaware. These parakeets have also established feral populations in Europe in Belgium, Spain and Great Britain. The origin of “monk” for this bird’s name is believed to stem from the gray-colored swath of feathers found on the bird’s breast, throat and forehead. The rest of the bird’s plumage is a bright green in color. The monk parakeet also has an orange bill. The birds are comparable in size to a mourning dove. Photo by Bryan Stevens These two Monk Parakeets now call Newland, N.C., home. Monk parakeets differ from most other parrots, which are almost exclusively cavity-nesting birds. Monk parakeets form nesting colonies and use twigs and branches to build large, bulky nests. Even a single pair of monk parakeets can build a substantial nest. A colony of these nesting birds usually builds a nest featuring several compartments. 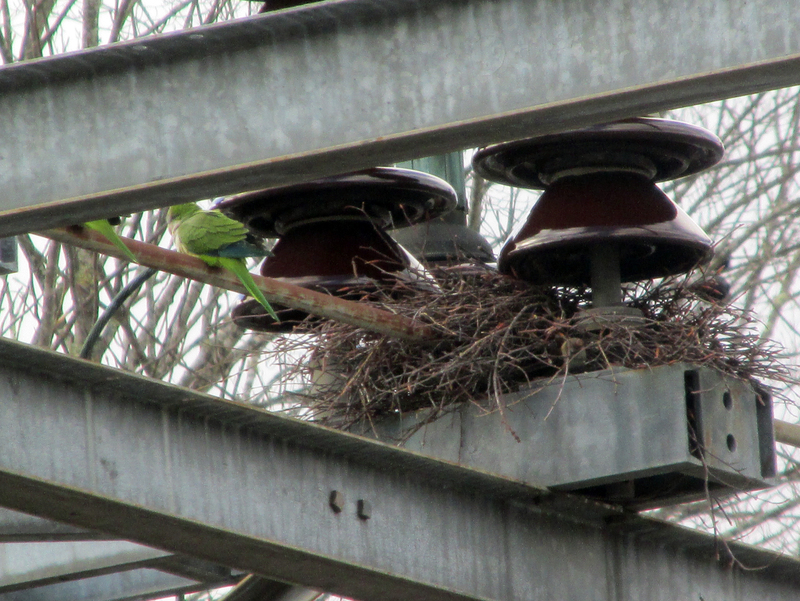 The pair of parakeets in Newland have already build a large nest among the transformers of an electrical sub-station. The industrious birds create some large stick structures, and nests weighing 90 pounds have been found. In the wild, these sociable birds form large flocks. In captivity, the monk parakeet can be taught an extensive vocabulary of words. The monk parakeet can live 20 to 30 years, with captive birds usually living longer than wild ones. 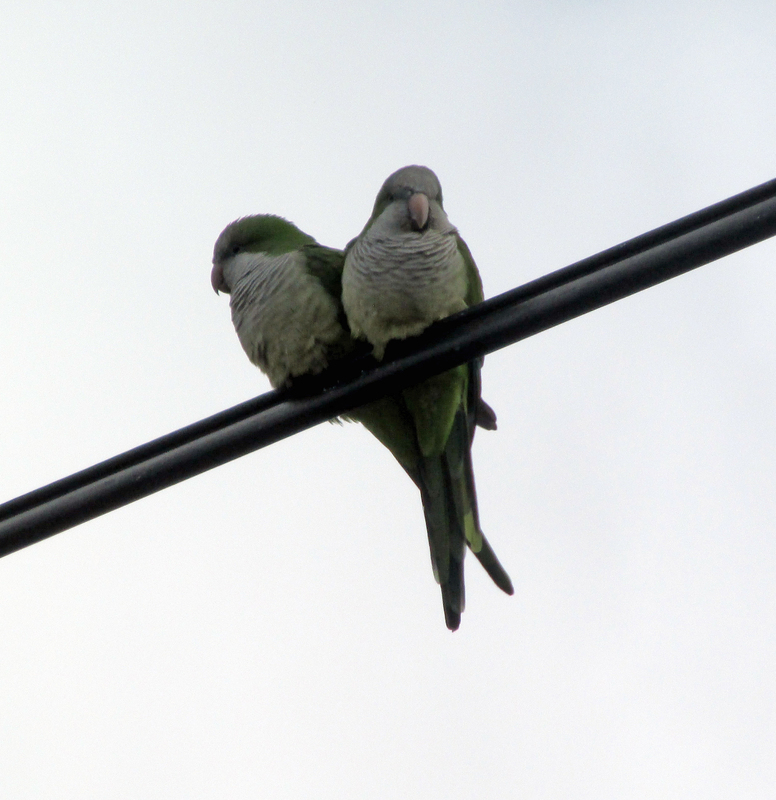 I was thrilled to see this pair of monk parakeets, but it also made me somewhat wistful for what might have been. It would be wonderful to have native parrots still flying free. The extinct Carolina parakeet ranged throughout the eastern United States, including the states of Virginia, Tennessee and North Carolina. If only the dawning of a more environmentally aware age had arrived slightly sooner, the Carolina parakeet might have been saved along with species like the California condor and whooping crane. This native parakeet, if it had endured, might today be considered an ordinary backyard bird. This entry was posted in Birding, Birds, Monk Parakeets, North Carolina and tagged Birding, birds, Bristol Herald Courier, Bryan Stevens, Carolina Parakeet, Carolina Parakeets, Carter County Compass, Elizabethton Star, Erwin Record, Feathered Friends, McDowell News, Monk Parakeets, Monk Parakeets in wild, Our Fine Feathered Friends, Quaker Parakeets, The Erwin Record on March 13, 2016 by Bryan Stevens. I enjoyed your post re the Monk Parakeets. Good photos of them!